The last post explained using OmniFocus for the first two GTD phases: collecting and processing. This post covers the next GTD phase: organizing. Organizing lets you focus on a small number of your tasks in any given situation rather than being overwhelmed by all of them at once. By definition, Omni-Focus is all about supporting such focusing and thus about organizing your tasks and projects so that you can easily select which ones deserve your attention at this or that moment. OF is a database of all your tasks and projects which means that it keeps several pieces of information related to each of them. Each task relates to a specific Project and a particular Context. In addition it has a Start and a Due date, a Duration, a Flag and a status of being Completed. Organizing is all about assigning these characteristics to tasks in your Inbox. It is usually done at the same time as processing, so it is part of clarifying, making sense of your entries. Sometimes you will also need to re-organize your tasks, for example during a weekly review process. The technique of organizing is covered in this MPU screencast (although David Sparks calls it processing). Let’s discuss how each of these criteria help you to focus in your day-to-day work. First, you can display tasks by Project. There is a special “Project” view in OF which is triggered by pressing ⌘1. In this view, you can see the list of all your Projects on the left. By clicking on a specific project you see only the tasks related to that project. Moreover, by pressing the Focus button you can make all other projects to completely disappear from the view. This is indispensable for deciding what to do next with each project. Projects can be organized by folders which may define your main areas of activities. 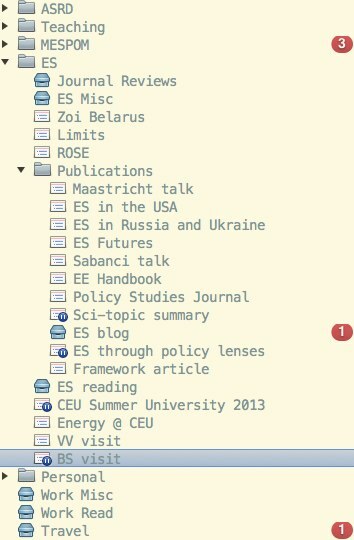 For example as many academics, I have ‘Teaching’, ‘Research’ and ‘Administrative’ folders. My Teaching folder has ‘MSc’ and ‘PhD’ subfolders and the PhD folder has projects each corresponding to one of my PhD students. Projects can be ‘Active’ or ‘On Hold’; as soon as you put a project ‘On Hold’ the tasks related to this project will stop cluttering your views. In principle, I try to keep not more than 50–60 active projects. The picture to the right shows some of my projects and folders (for those who are particularly curious ES means “energy security”). Note that some projects are on hold (those have a ‘pause’ icon) and some look like cardboard boxes – those are actually not projects but single action lists. Secondly, you can display your tasks by Context by pressing ⌘2. A ‘context’ is a GTD concept which designates a particular situation in which tasks can be done. For example, some of my tasks can only be done when I am at home, or when I attend a Faculty Meeting, or when I am in Budapest, so I have contexts called ‘Home’, ‘Faculty Meeting’ and ‘Budapest’. In the same way as you can focus on a particular project you can focus on a particular context and see tasks only relevant to this context. For example, when I am in Budapest I check the list of tasks which require my presence in Budapest to be completed. One interesting context I have is called ‘Writing’ – I am planning to discuss it in one of the next entries. In contrast to projects, contexts cannot be organized in folders, but they can be hierarchical, which is almost the same. For example, I have a group of contexts called ‘Places’ where I list all cities I frequently go to. Another group is called ‘People’ which essentially keeps my discussion- and ‘watch-lists’ of people I work with. Contexts can be put ‘On Hold’ which makes all the tasks related to that context inactive (and if you wish invisible). Thirdly, each task’s Start and Due date, Duration and Flag are very useful for displaying only those tasks which you want to focus on. For example, a very typical task for me is to check in online for my flight. I add to to OmniFocus when I receive an email with my flight ticket. This task can only be done starting 24h before the flight, so I always add a start date (and a due date of course). As a result the tasks pops up as a reminder not earlier than it can actually be accomplished. I also learned from MacSparky to use Start Date to control availability of my tasks (i.e. if I know that I won’t have time to do something this week I indicate the start date on this task as next Monday and skip seeing it every time I look at my task list). Another example: when I only have one hour at my desk I want to see all the tasks with Duration under 1h (so that I can accomplish as many of them as possible) so I can apply an OF filter ‘Duration <1h’ (available right from the toolbar).